would like the set if the nonstick coating didn't come off so easily. I use this cookware to prepare my daily meals. It is good for one pan meals. The quality of the cookware thickness is very poor. I don't recommend cooking with high heat with this cookware set. It's better to cook with low to medium heat settings with this cookware set due to the material thickness. The size of the cookware set is smaller than the average cookware set. Its the perfect size for me. The 1st time that I used the small frying pan, the "non-stick" coating became damaged. As if it almost melted. I used oil & a plastic utensil -- I'm experienced in cooking and baking. I bought this set (after reading the description) for my daughter as a gift for her 1st apartment. It is too lightweight, in my opinion. The handles easily bend away from the pans? I am very disappointed in the quality, I am a Miles Kimble customer of many years, and would not have expected them to have endorsed this product into their offerings. I expect the set to last a few months at the most. My daughter cannot be without a set of pots & pans, or I would return this poor-quality set. I will look now to replace this set with a higher-quality set. What a waste of money. And a disappointment in a housewarming gift that I gave to my daughter as well. I use this product with extreme care because the thickness gage of the steel is very thin. High heat will cause pan warping. It can be used for cooking low temperatures on stove top and in oven. Due to size of pans recommend for single person use. To small for family use. This cook ware is very fragile when cooking with high temperatures. Very poor quality for the product price. I am single older cook. The non stick coating scratched off with plastic utensil stirring on the first use. The size is small, like a child's toy version of cookware. So you get what you pay for. They are not worth the price. If it wasn't so much trouble I would send them back. Our camper needs stocked. We're starting over, so I saw these pans, and they're ideal for our camper. good quality, good price, and the set contains all pans I need. My cookware was old and this was a good price. 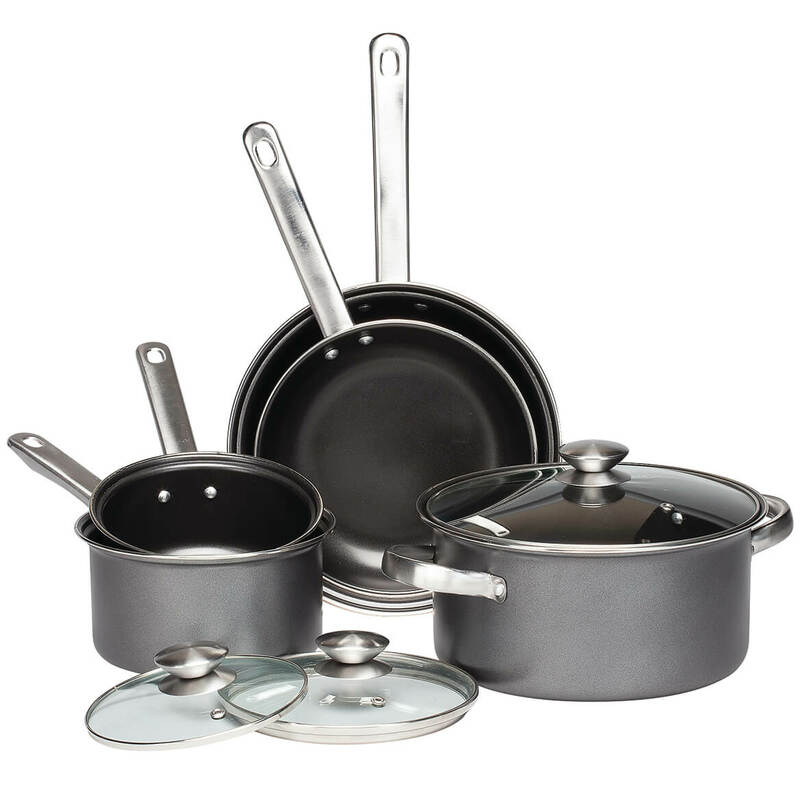 This 8 piece cook ware set isn't fit to be used in the kitchen on any stove top or in the oven. This cook ware set is the poorest quality that I have purchased ever. Instead of returning this item, I turned it into wall art and flower pots because that was the only thing I could come up with for using it. Can it be used on an induction stove?